U.S. economic growth slowed during 2006, as the residential housing market entered a much-anticipated decline. Inventories of new and existing homes surged; price increases slowed from a double-digit pace; and, in many markets, prices fell substantially. While housing and housing-related sectors saw steep declines in 2006, the industrial sector continued to grow (though at a slower pace), and the consumer sector has been buoyed by higher wages and job growth. The solid job market, rising wages, and retreating gasoline prices helped support consumer spending—which increased at a slower 3.1-percent pace—in 2006. As home prices soften, consumer spending will grow more in line with incomes during 2007, increasing by 2.7 percent. The unemployment rate—which dipped to a 5-year low of 4.4 percent in October 2006—will edge up, averaging 4.8 percent in 2007 and 5 percent in 2008. The business sector drove economic growth during 2006, creating more than 1.8 million jobs, and it will continue to be the force behind growth over the next few years. The dollar continued to weaken, and global economic growth strengthened, encouraging export growth to its highest level ever. Capacity utilization rates remain high, and corporate profits are solid as the economy enters 2007, offsetting the declines in residential construction and light vehicles. 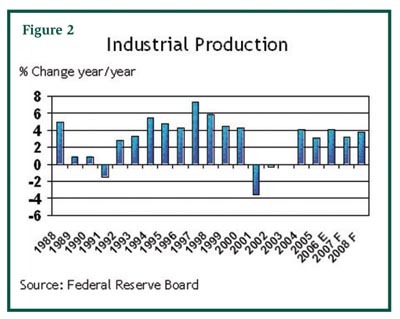 Industrial production grew by 4.1 percent in 2006, up from 3.1 percent in 2005. As the cycle matures and construction-related markets (materials, supplies, etc.) 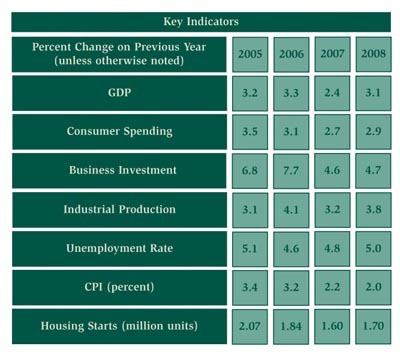 drag, industrial production will moderate to 3.2-percent growth in 2007. As a result, business investment—which grew 7.7 percent during 2006—will post growth of 4.6 percent in 2007 and another 4.7 percent in 2008. The Federal Reserve, which increased interest rates throughout 2006, likely will start cutting rates by the second quarter as the economy cools and inflation moderates. The overall economy, which grew at an estimated 3.3 percent in 2006, will slow to a 2.4-percent growth rate in 2007—the slowest overall economic growth rate in 5 years. In 2008, housing is expected to firm, and gross domestic product (GDP) growth will resume at a 3.3-percent rate. While a soft landing is anticipated, there are several risks that could rattle consumers, including an unexpected sharp increase in energy prices, a more pronounced collapse in housing, another terrorist attack, or a flu pandemic. In a recent survey of economists in The Wall Street Journal, the percentage of those predicting a recession in the next 12 months rose to 1 in 4, revealing the delicate balance of factors influencing economic growth over the next year. At the start of 2007, energy prices had retreated from recent highs as mild weather and slowing economic growth eased demand. Overall energy consumption in the United States is expected to grow by 1.2 percent in 2007 and 1.7 percent in 2008, according to the Energy Information Administration (EIA). This follows a 0.4-percent decline in 2006 due to unusually warm winter weather and higher prices for energy. As measured by total energy demand per dollar of GDP, U.S. energy intensity improved by 3.5 percent in 2006 and is expected to improve by 0.9 percent and 1.5 percent in 2007 and 2008, respectively. In 2006, natural gas consumption declined by 1.3 percent, as last year’s warm winter and high prices constrained demand. At the start of 2007, much of the United States again has experienced unseasonably mild weather due to El Niño conditions in the Pacific. As a result, demand for natural gas heating has been curtailed; natural gas inventories were at the highest level for the first week of January since the EIA began collecting weekly statistics in 1994. Pipeline imports from Canada are declining as Canadian natural gas consumption is rising to fuel its tar sands projects and petrochemical sector. Liquefied natural gas (LNG) imports have risen, however, and will continue to rise to meet demand, nearly doubling between 2006 and 2008 to 1.1 trillion cubic feet (Tcf) as four new terminals come online. The benchmark Henry Hub price for natural gas averaged $6.75 per million British thermal units (Btus) in 2006 and will continue to rise over the next several years, averaging between $7 and $8 per million Btus until significant supplies from Alaska become available. Oil markets continued to make headlines during 2006, as West Texas Intermediate (WTI) crude oil prices rose above $75 per barrel over the summer and gasoline prices hovered near $3 per gallon for much of the year. However, as inventories rose and tensions eased in Iran and other hot spots, prices retreated to just over $60 per barrel by the end of 2006. The EIA predicts that U.S. crude oil consumption will increase by 1.3 percent in 2007 and 1.4 percent in 2008. Globally, demand for oil continues to surge in developing economies, especially in China, where imports of crude oil climbed 14.5 percent in 2006. With China’s expanding economy and strategic petroleum reserve coming online, the country’s imports are likely to continue in the double digits in 2007. These trends, in addition to Organization of the Petroleum Exporting Countries (OPEC) production cuts, will maintain pressure on prices and keep them from falling below $50 per barrel. As a result, the EIA expects average crude oil prices to decline by 2.4 percent to $64 in 2007, as the U.S. economy cools further, before rising modestly in 2008. As Democrats have taken back Congress, there is renewed interest in climate change and energy efficiency. Policies that will increase the cost of carbon-containing fuels—especially coal, the most carbon-intensive—are expected. Energy efficiency in all areas of the economy have been given high priority by policymakers. This may result in additional funds for energy efficiency research and development (R&D) and more incentives for businesses and consumers to make energy-efficiency investments over the next few years. This is welcome news for insulation manufacturers and installers, whose products are critical to achieving the nation’s energy-efficiency goals. The $1.2-billion construction sector directly accounts for nearly 10 percent of total GDP. This does not include the many industries that support the construction sector, such as architects and suppliers. As a result, the health of the construction sector is vital to the U.S. economy. Rising interest rates slowed the overheated housing market in 2006, and price growth for construction materials outpaced overall inflation. However, overall construction remained steady as gains in nonresidential and public construction partially offset declines in the residential sector. Housing starts declined from 2.07 million units in 2005 to 1.84 million units in 2006 as the housing market collapsed. After the housing market—which currently accounts for more than half of total construction spending—reaches bottom during the first half of 2007, modest increases are expected in the second half of the year. Overall, housing starts are set to decline further, to 1.6 million units during 2007, before rebounding to 1.7 million units in 2008. With the robust job market, office vacancy rates continue to decline. Office rents grew by 9 percent during 2006, according to Reis, Inc., a real estate research firm. To meet the demand, Reis reports that 72 million square feet of office space—the highest level in several years—should come on the market in 2007. Construction spending in the nonresidential sector increased by 16.5 percent during 2006, with nearly all segments posting gains. Expenditures for lodging construction grew 52.6 percent, and office construction was up by 18.9 percent. Spending on the power infrastructure grew 14.8 percent, and spending on projects in the manufacturing sector—driven by high corporate profits—was up by 20 percent. Rising school-district and university budgets spurred an increase in education spending, the largest category after residential. Highway and street construction also grew with passage of new federal highway authorization legislation. 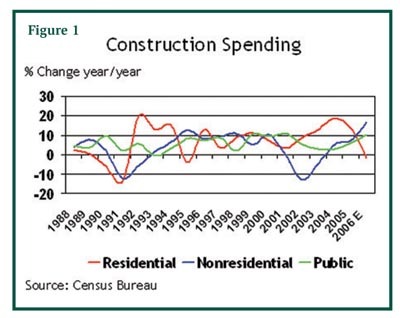 In all, public construction spending grew 10.2 percent in 2006. Continuing growth in commercial and public construction will drive the construction sector through 2007.
chemicals remained strong, however, and output grew by 2.1 percent during 2006. Despite the slowdown in housing and light vehicles, the outlook remains good for many chemical-consuming industries, including electronics, packaging, apparel, and rubber products. Plastics and appliances—both key end users of chemicals—are looking for more modest growth through 2007. As a result, chemical industry volumes are set to grow by 3.2 percent in 2007 and 2.5 percent in 2008, according to the American Chemistry Council. The petrochemicals segment is expected to grow by 3.1 percent in 2007 and 1.9 percent in 2008. Gas processing. Despite continuing damage from the 2005 hurricanes, the natural gas processing industry increased its output of dry natural gas and LNG compared to 2005’s. The EIA estimates that domestic production of dry natural gas rose by 2.6 percent in 2006—the first increase in domestic natural gas production since 2003. LNG production rose 0.7 percent, averaging 1.73 thousand barrels per day (Mb/d). Production of dry natural gas is expected to rise 1.9 percent in 2007 and 1.3 percent in 2008, according to the EIA. LNG production is expected to rise 1.7 percent in 2007 and 0.6 percent in 2008. In addition, new supplies of LNG will increase outputs at gas-processing facilities. The LNG market has grown more than tenfold since 1996, before natural gas prices accelerated. The EIA projects that LNG imports will surge by 34.5 percent in 2007 and 38.5 percent in 2008 as four new receiving terminals begin operations over the next 2 years. Petroleum refining. With a combination of high inventories of refined products, cooling demand related to weather, and reaction to high prices, refining output grew by a modest 0.5 percent and capacity utilization fell from 90.6 percent in 2005 to 89.6 percent in 2006. Refinery output is expected to grow by 1 percent in 2007 as demand firms. According to the EIA, refinery capacity utilization rates will tighten to 89.9 percent in 2007. Refinery capacity is expected to remain steady at 17.4 million barrels per day (MMb/d). Food processing. The $658-billion food and beverage industry grew by 3.5 percent in 2006 and is poised to grow by 1.5 to 2 percent in 2007. Growing demand for organics, convenience foods, whole grains, and functional foods and beverages (including energy drinks and products containing antioxidants and probiotics) will drive the food-processing industry over the next year. Organic foods, which accounted for 2.5 percent of all U.S. retail food sales in 2005, are now common in traditional grocery stores and will continue to grow at double-digit rates. Shipbuilding. The $14-billion shipbuilding industry is expected to grow by 2 percent during 2007 and 2008 as international shipping and the defense sector continue to provide solid demand. In volume terms, world trade is expected to grow by 2.2 percent in dollars, following a 4.6-percent increase in 2006, according to the International Monetary Fund. One trend of interest to insulation producers is increasing demand for tankers used to transport LNG. Pulp and paper. The $163-billion pulp and paper industry was hampered by higher costs for energy, chemicals, and transportation. The industry continues to be challenged by increasing imports, competition with other materials for packaging, and the increasing reliance on electronic communications and transactions. The U.S. paper industry produced an estimated 41.3 million tons of paper in 2006, down 0.2 percent from 2005. Paperboard production, which follows packaging trends, was up by 1.4 percent in 2006. Following several years of increasingly poor returns, some less profitable mills closed and capacity declined. The American Forest and Paper Association projects that paper and paperboard capacity will increase by 0.2 percent in 2007 and 0.4 percent in 2008. Power. The EIA projects that U.S. electricity consumption growth is expected to moderate to 1.2 percent in 2007, thanks to higher prices (from expiring rate caps) and a return to more normal weather patterns this summer. Electricity prices are headed up as utilities pass along increased costs from fuel prices, stricter pollution abatement equipment, and new transmission and generation infrastructure. According to the EIA, electric generating capacity additions are expected to total 21.4 gigawatts (GW) in 2007 and 18.1 GW in 2008. Natural gas-fired generation accounts for 81 percent of the total planned additions, with nonhydro renewables and coal contributing 8 percent and 7 percent, respectively.